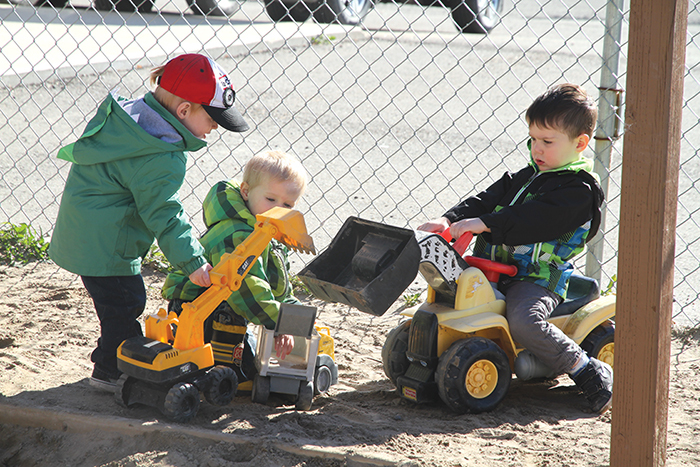 Children playing outside at Play Fair Daycare in Moosomin. Day cares are taxed inconsistently across the province of Saskatchewan. A petition is being taken up in Saskatchewan seeking tax exempt status for licenced day cares in the province. Earlier this year, the board of Play Fair Daycare in Moosomin approached Moosomin town council for a tax concession. After lengthy debate, council turned down the request. Play Fair Daycare is assessed as a commercial building, and faces a property tax bill this year of $17,651.26. Daycares elsewhere in the province face a wide array of municipal tax situations. Some are assessed commercially, some are assessed as residential properties, and some, located in schools or churches, are tax exempt. In Alberta, Manitoba, and New Brunswick, licenced day care centres are tax exempt, and in British Columbia and Ontario, day care centres are taxed as residential properties, not commercial. Play Fair Daycare director Terri Lowe said the petition drive started with a group of day cares in Regina. “Some of the day cares in Regina that were being taxed as residential were reassessed and now they are being taxed as commercial. So some of the day cares that were paying $3,000 or $4,000 are now paying $12,000, plus not all of the day cares are being taxed. The ones in the schools aren’t being taxed. There’s just a huge inconsistency of who is being taxed. She said directors of several Regina day cares got together and began the petition drive. “We have petitions at the day care for people to sign, board members have taken them out, the staff have taken them out. How big a difference would it make for Play Fair Daycare if it didn’t have the annual tax bill? Play Fair Daycare serves 150 children. “When we moved over there we had 41 spaces, and now we’re at 75,” says Lowe. “Our enrolment is 150 between part-time, casuals, and full-time. We have a lot of kids in there. She said she is hopeful the petition drive will have an impact. • Childcare Centres are institutions of early learning and childhood development. It is appropriate that they have the same tax treatment as schools. • Recognize that licensed, non-profit childcare Centres provide programs that are foundational to a healthy society by including them in the Saskatchewan Education Act. • Exempt all licensed, non-profit childcare centres in Saskatchewan from property tax through changes to the appropriate legislation.